The violence seen in Lahore last week was aided by a bigoted constitution. How has stock in our nationhood plummeted so? The recent attacks on a prominent shrine in Lahore demonstrate how the unrest in Pakistan is caused by a minority of few who cannot tolerate the plurality of beliefs in Pakistan. The Tehrik-e-Taliban are lying through their teeth when they claim that they do not attack public places. It’s becoming more and more apparent that these militants aren’t resisting American hegemony; this a war to determine Pakistan’s future and, by proxy, the future of Islam. 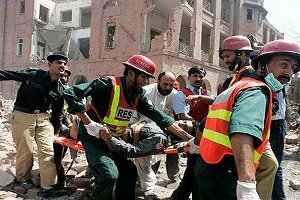 Whether the Tehrik-e-Taliban actually arranged the bombers’ suicide belts is irrelevant; they have created a domino effect that’s likely to spread from commercial capitals such as Lahore to cities with historic shrines and Pakistani historical sites, such as Multan, or Taxila. Unlike Baghdad, where violence between Islamic sects is a product of the war America is waging, the onus of last Thursday’s blasts falls squarely on us, the citizens of Pakistan. We have been complacent about sectarianism for too long. A good friend who works for a transportation company told me in 2007 that in villages along the highways to Waziristan where the Taliban had seized control were the bodies of butchered Shia Muslims. That year, Lahore’s public was too busy mobilising about the judiciary and President Musharraf to pay the violence any mind. They say in Africa that when elephants fight, it is the grass that suffers. To this Julius Nyerere had once added that when elephants make love, the grass still suffers. Nyerere had made this witty remark at a summit of the Non-Aligned Movement in the 1970’s. The organisation had been formed to extricate as much of the world from suffering the same fate as the grass in this African proverb, during the Cold War. Yet, it failed Afghanistan as most of NAM’s members were anything but non-aligned. Unfortunately, this included its leading lights. The US decided to give the USSR a bloody nose in Afghanistan. It seemed no one cared for the poor country caught in the crossfire. Washington found Gen Zia ul Haq’s Pakistan to be a more than willing partner. For the Pakistani dictator, this was an unbelievably lucky opportunity to gain international ‘legitimacy’, even recognition. But for Afghanistan and her people this superpower showdown meant the worst misfortune, misery, death and destruction in the country’s history. The misery continues even two decades after one of the superpowers is no more. In September 2009 I wrote to two Sindh government departments seeking harmless information on matters of education and pollution that should anyway be available to all citizens. I was confident that a formal request under the much trumpeted and much ‘seminar’ed Freedom of Information Act will do the trick. The law requires a response within 21 days. When nothing happened for 4 months, in Jan 2010, I approached the Sindh Ombudsman (as suggested in the law) to ask the concerned departments to do the needful. After digesting my request for 3 months, the Sindh Ombudsman finally asked the concerned departments (Education and Environmental Protection Agency) to appear and explain why they did not provide the information that had been asked for. I too was asked to appear. So I spent the 1st of April (like a fool) in the Ombudsman’s office, hoping that the real culprits would make an appearance. Nobody turned up and the helpless Ombudsman gave a new date of April 6, for all parties to appear again. On 6th April I wasted another day waiting in the Ombudsman’s office, but again neither department put in an appearance.